I’ve discovered that most people only log their time in their timesheets if it is billable. I’m going to give you a new reason to track all of your time, even the unbillable moments in your day. Imagine being able to pull up a graphical chart showing your billable time compared to your unbillable time. You could see at a glance that a large chunk of your day was either billable or unbillable. Companies call this an employees utilization, and the goal is to have a large proportion of your day be billable. It’s great information to have, because you can keep appraised of your overall effectiveness. Well, our tool will give you the ability to see how your time is utilized, but it won’t tell you this unless you log all of your time. Billable and unbillable. Don’t worry, we’re going to make it super easy to do all of that, so it won’t be a pain. 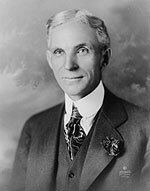 In reading Free Prize Inside!, I ran across a paragraph about Henry Ford. I’ll quote below from the Wikipedia article. Ford astonished the world in 1914 by offering a $5 a day wage that more than doubled the rate of most of his workers. The move proved hugely profitable. Instead of constant turnover of employees, the best mechanics in Detroit flocked to Ford, bringing in their human capital and expertise, raising productivity, and lowering training costs. What strikes me most about this tactic is that it goes against everything you would think works. Raising the pay rate of your employees to more than double their current rate — that has failure written all over it. Created massive interest and desire to work at Ford Motor Company. Drove employees to work harder and produce more, because they knew there were 100 people that could fill their position. Generated a lot of interest in Ford Motor Company. Enabled Ford workers to afford the cars they were producing. Ford’s innovation is a fascinating look at how one company maximized the productivity of their workforce. It’s a good use of time. Our product is going to be really cool! We believe we have some truly innovative offerings that nobody has and will be the driving force behind why people choose our product. Too bad I can’t share them with you! 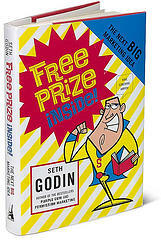 When our public beta has commenced, I will be able to tell you what they are, but for now, I want to share some things I have learned from reading Seth Godin’s book, Free Prize Inside. I admit to being one of those people who rarely buys books. I wasn’t always like this. In the late ’90s I was an avid business book reader. So why did I buy this book? First of all, I’ve been reading the author’s blog, and he usually has at least a few great posts a week worth thinking about. Secondly, the concept of a free prize interests me. A free prize is something about your product or your service that is worth remarking on, something worth seeking out and buying. The free prize isn’t about what people need, it’s what satifies our wants. In today’s market, a free prize can drive your products success — rather than expensive television or online advertising campaigns. A free prize gets people talking about your product, and gives you a huge edge. It’s something your competition doesn’t have. The free prize is often something simple, rather than an expensive overhaul of a business. We think that’s what we’re doing with Roundup — building off of the typical time tracking methods, and creating a new way to track your time. We think our product has several free prizes. Stay tuned. Roundup is several months away from Beta, however you can now sign up to receive the announcement when we do launch. We need people who are interested in beta testing our web application. Don’t worry, we won’t spam you, and you can unsubscribe at any time. We’re calling Roundup the next generation in time tracking, and we don’t think it’s an overstatement. Current tools enable you to log your time and create simple reports. We believe that time tracking can be much more than generic time reports and we’re going to show the world what it can be. If you’ve ever had clients and worked in the services industry, you will know as I do that there are sometimes situations where you should have said no to a request, but didn’t. Then, a few days later, you regret it and find yourself missing deadlines. I discovered some great tips online that I wanted to share. They’ll help you learn to say no, when you should. Click here to read them. Excel at just a few things, rather than being just average at many. Don’t try to do everything. You have a right to say no. Remember that others may take you for granted and even lose respect for you if you don’t. One of the key things I’m learning about as we build our web application, is that it’s far too easy to lose sight of what your product does. Originally when we set out to build Roundup, it was just a tool for tracking your time. Over time we realized a lot of people create lists of things they need to do, and then track time against those lists. So we added a task area. Of course, we couldn’t stop there. We knew we had tasks and tasks are always associated with a project. So we had to create methods for managing projects and clients. Before we knew it, we weren’t sure if we were building a time tracking application, or a product that helps you manage your projects. This presents a number of questions. Where does our product fit in the market place? Does it compete with time tracking applications or project management applications? Do we market it as a time tracking application (its strength) or as a project management tool? And does it step up to the plate in every area? Or is it strong in one and weak in another? These are the challanges we are facing at the moment. I will of course continue to post here about our progress. Welcome! I’m Chris and I’ll be your host on this journey. This blog is about our efforts to create a web based time tracking system, and will be the support site for the application we are building. In addition, we’ll be posting handy tips and tricks for ways to maximize your time and efficiency. I thought our first post should be symbolic of what we’re doing. So I’m going to post some of the different ways people have tracked time over the years. 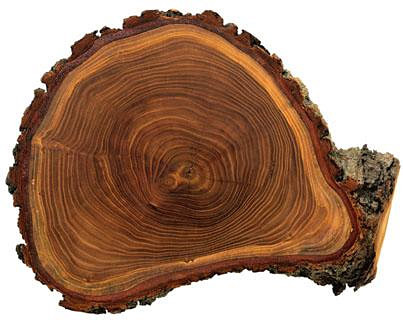 Dendrochronology or tree-ring dating is the method of scientific dating based on the analysis of tree-ring growth patterns. One of the neat things you can do with tree ring dating, is compare multiple trees and crossdating. View this photo to see an example of how this works. There’s even more information about the tools and methods for tree ring dating here.